It took forever and it was so much fun! Crazy. Mr. Sarah was all, “man, you say you’re going to learn how to do something, and you just go and DO it.” Well, yeah. As long as it has to do with making little things with tools, requires minimal human contact, and I want to learn it badly enough, I’m all over it. About this piece – it was very much a make-do kind of project. All the connections were formed with tube, although I would have preferred to use some heavy gauge wire for the connection of the loop to the bead, and for the loop itself. But I dealt and sawed the loop from sheet – which was surprisingly difficult. I had a very hard time sawing a straight line. Oh well. Next time I may just use the snips. I sawed and filed the flower thingees from sterling disks, and I rather like the random tool marks left on the flowers… this piece already looks aged with love. I like the odd little saw gap between the petals, too. It measures over 1 1/2 inches from top to bottom, and over 1 inch wide. So, what do you guys think? Is this a design worth exploring a little further? It’s a good start, at least. Thanks for celebrating with me! Now, I think I’ll go pass out after a full day of obsessing over one small strip of sterling. It’s fabulous, Sarah! You really do gain an appreciation for all of the work that goes into a new art when you spend so much of your blood (hopefully there was none), sweat and tears on it. 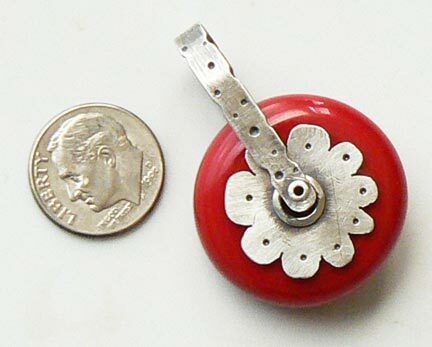 It’s a great design, and ripe with possibilities for your incredible beads. Thanks Patty! Nope, not too much blood… I got my finger a little with the saw the other day, but nothing too major. I like the pendant. Go with it. Yeah, if you don’t have a hole down the middle of you, you can just go, thanks. I love this new route you’re on and am delighted to be able to follow along. I’m pretty much a hermit, too, and when I delve into new things, like you, I put on the blinders and don’t see much beyond my own stuff. Thankfully, I have an understanding husband (who cooks)! P.S. And I LOVE the pendant! Thanks Sally! Glad you’re enjoying it! My husband cooks too, but I still have to cut up the onions when I want them teensy-tinsy. That is amazing! I love it! When I took a metalsmith class, she said to use a scribe and ruler to get a straight line, and when you are sawing keep you eye on the line just ahead of the blade to keep it straight. I used my dividers to scratch a straight line with the edge of the sheet, so it isn’t like I have a good excuse for not being able to saw a straight line. I was embarrassed at myself. But I’ll try looking ahead next time. I think I’ve heard of that before, actually. I’ll put it on my list of things to try next. I can tell that sawing, even though I’ve only broken 3 blades so far, is going to be one of the bigger challenges before me. Sarah, you’re off to a great start. The more sawing you do, the easier it will be. I must admit that sawing and I have never been the best of friends, but having the skill comes in very handy! 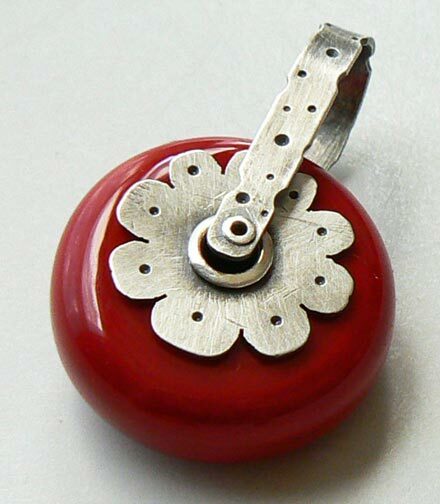 I look forward to seeing what comes next – the pendant is a lovely way to marry your beads and metalsmithing! That is so awesome! I was terrified of the saw the first time and I don’t even want to TELL you how many blades I broke. But it’s so uplifting when you make your first piece! As amazing as your glass is, I predict your silver work will be exactly as amazing. Thanks Lori! I imagine you shrinking away in horror from the benevolent little saw. Love it! In my favorite color, too. Lots of personality…perfect. Love following along on this new journey. I am well impressed! It’s beautiful! I just recently bought some sheet and snips to cut my own shapes to weave into. I’m hoping to get a saw for my birthday! Always sending the Best Wishes for all the Steps pf your Art!